The Empress shares that you are promised growth, prosperity and fertility in all things – your needs will be fulfilled with joy and satisfaction. Your original seeds were well planted – the harvest is wonderful and now is the time to reap the benefits -the results will be much larger than you anticipated. Look forward to a happy conclusion – you are coming to the end of hard work and sacrifice. Soon recognition and rewards will come for all your efforts. Respond to your memory and it will produce growth through your imagination – the solid stability which is the activity behind all manifestation. Growth, expansion and freedom result in self-expression, luck and extravagance as your talents and interests unfold. Freedom and growth are the keys – allow yourself to experience the fruit of your “inner” mind, your creative imagination through which you give birth to your sense of physical reality – all possibilities stream from here. We all grow through open-hearted encouragement and understanding. Through your imagination you can project ideas into the future, anticipate behavior and integrate your outer and inner experiences as your conscious mind focuses on the intent, combines with the knowledge of your inner, intuitive mind to project the images into future reality. Give your loving heart, your creative mind, your physical energy and your spiritual understanding to help yourself and others unfold. The power of LOVE is twofold – divine and human. It is united through human words or action and it provides more than simple “healing”. It restores freedom as it releases you from doubt, fear, hate, apathy and despair. The inspiration and intuition that you seek can not be accomplished by your “will” – they are gifts from above which are preceded by the efforts of your “will” to become worthy of those gifts. Instead of putting forth your hand to “take” – learn to open your mind, your heart and your will to “receive” that which is graciously bestowed upon you. There is no faith, hope or love without the experience of “grace” – which is the Divine gift. No logical reasoning or moral action, can awaken faith. Reasoning eliminates the obstacles, misunderstandings and prejudices in order to help you establish the state of “silence” necessary to allow you to experience faith – the silence which “moves” the soul. No spirit, soul or body could live if entirely deprived of all love, hope and faith. Experience the “silence” and the Divine within you will spark love and make it grow and spread through His “grace”. Emotionally preserve the essence and quality of life; mentally give birth to new ideas; physically nurture your life creations and spiritually protect them with a healing and compassionate hand. Life in the mental body – education, knowledge, teacher of teachers, student of students – oracles and prophets report here. The birth of logic and reason. The organizing and ambitious side of “female” energy aspiring to the best for herself and her family/friends. Who is inspiring and nurturing you? How are you indulging your senses? In the first position: Your abilities are needed to bring greater efficiency to bear. There is strong discipline here as you feel the calling to further the progress of civilization along the ideal of the Greeks, especially Plato. Education and knowledge are your tools. Your motivation must strive for an understanding of God and the nature of spirituality if man is to progress. In the second position: Your physical foundation rests on stability itself. Good habits and a regimen of daily rituals that serve you well, keeping you healthy and fit. Your education will serve you wherever you go. In the third position: This is your call to accept leadership and responsibility, to organize and move forward with mental goals. 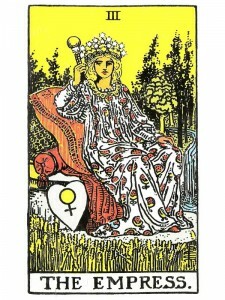 Meditate on The Empress to find guides who may want to use this archetype in this reading. In the fourth position: Here is a love for the ideal of Empress/Princess. The established, all capable female – not the damsel in distress. In the fifth position: At this time you are clear headed, a good judge of character and situations with keen self-awareness. Others are sensing and trying to avail themselves of your spirit of cooperation. A person – the Empress – may be giving you good advice. In the sixth position: As you take on more knowledge and responsibility in the near future to satisfy your hunger for self-improvement and advancement, you must make the necessary adjustments in your Emotional Plane. Do your loved ones want the same things for you that you do? In the seventh position: You feel the time might be right to seek additional authority and power for your proper growth and for the benefit of others. You know you may have to acquire more knowledge or stretch a bit. In the eighth position: The Empress may actually be on the scene, or at least her energy is here. Your position is strong and defensible if necessary – to some she is the Archangel Gabriel and guides the suit of Swords. Your karmic purpose is on-line and productive. In the ninth position: You appreciate yourself and your abilities, your power and position in this well-deserved moment. Your heart may be disposed to the person of The Empress. In the tenth position: The near future shows many windows of opportunity opening for you, but with considerably more responsibility than at present. The Empress may be a woman figuring significantly in this. Here comes the status you have waited for. This can be a re-assertion of the mental aspect of your karmic contract.